Wow it has been super crazy around here this week! A lot of finishing and designing and organising and a wee bit of relaxing as well. 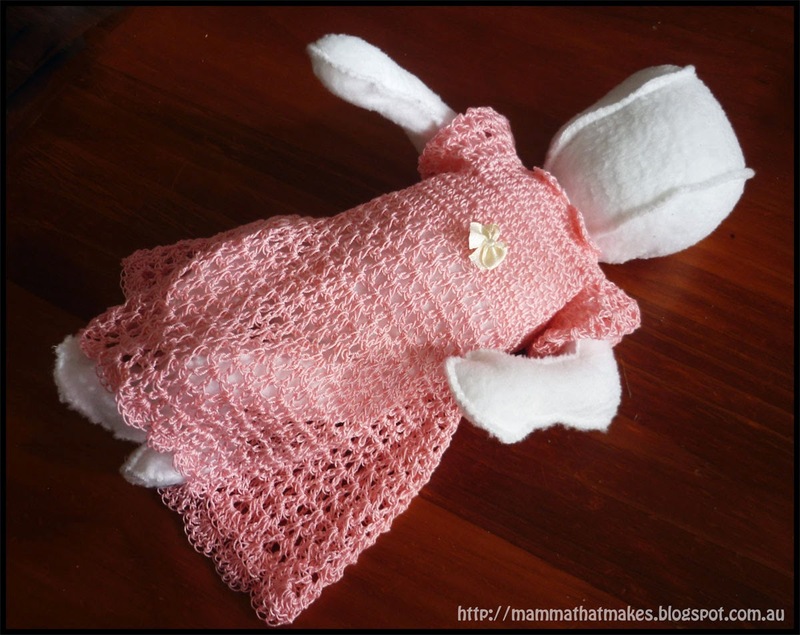 Today's pattern is a lovely little gown made from thread. A huge thankyou to Lisa from Crochet Quackers who sent in the thread for me to play with. The thread I am using today is DMC Babylo, which is a 3ply size 10 cotton thread. It is incredibly light. I used the best part of a 50g ball for the dress, and I am hoping I'll have enough left from the ball for a matching hat. Working with thread can be a little challenging, and it does take a bit more time then a thicker yarn, but the results are so wonderful that it is definitely worth the effort. 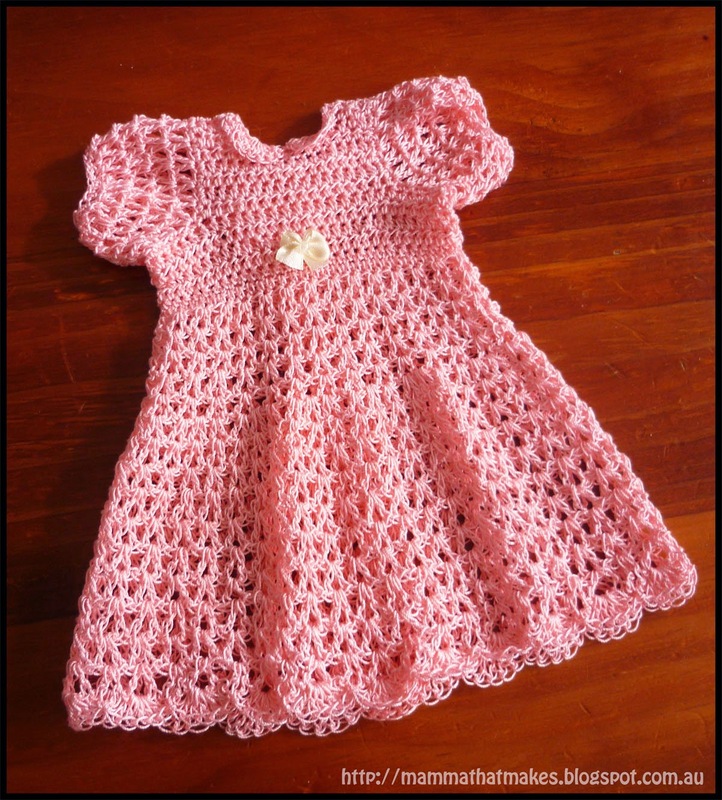 This gown is designed to fit a bub of 26 weeks gestation, however you could upsize it using thicker yarn/larger hooks. I intend on testing it with some 5ply sports weight down the track, so I will let you know how that goes once I have done it. 7-9: ch2, turn, hdc 12. End off. Lay the piece with the 12hdc rows on the right,count off 10 stitches from row 5 and join yarn in the 11th. 15-20: ch2, turn, hdc across - (4) End off leaving a long tail. 22-27: ch2, turn, hdc across - (4) End off leaving a long tail. 38: ch3, turn, *(dc, ch1, dc) in the first 2 ch1 spaces, (dc, ch1, dc) in the space BETWEEN the ch1 just used and the next ch1 space* (this makes our increase), repeat across, dc in the top of the ch3 at the end. 48: ch3, turn, 2dc in the same stitch, *sl st into the next ch1 space, 5dc into the next ch1 space* repeat across, 3dc in the last ch1 space, dc in the top of the ch3. 2: ch4, dc in the same stitch, *skip 1, (dc, ch1, dc) in the next stitch* repeat around, join to the 3rd chain from the starting chain. 3-6: sl st into the ch1 space, ch4, dc in the same space, (dc, ch1, dc) in each ch1 space around, join to the 3rd chain in the starting chain. 7: ch1, sc in each ch1 space around, join. 8: ch1, sc in each stitch around, join. Mark off the front 11 stitches of the neck as shown below. 2: ch1, turn, sc until you get to the stitch before the first marker, skip 2 stitches, dc 10 times in the next stitch, using the front loop only, skip 2 stitches, sl st into the front loop of the next stitch, skip 2 stitches, dc 10 times into the front loop of the next stitch, skip 2 stitches, sc in all remaining stitches. If your collar sits up a little you can iron it down, press it, or using the same yarn tack it into place. Add a button to the back of the gown and the small bow to the front. You may like to also run a ribbon around the bottom of the bodice if you prefer that to a bow. Laid flat this gown measures approx. 22cm from the shoulder to the hem, and 12.5cm across the bottom of the bodice before the skirt section when laid flat.